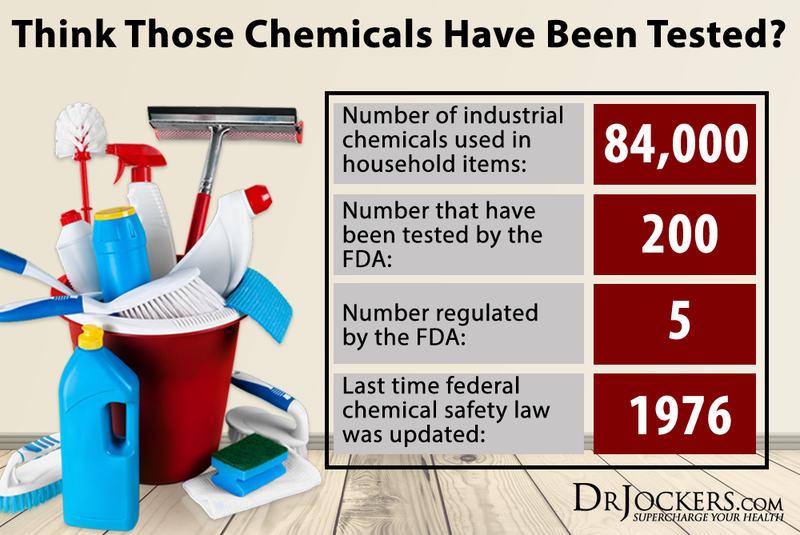 Our society uses a lot of cleaning products that contain a number of chemical toxins. It is estimated that up to 25 gallons of toxic substances are concentrated in the average household (1). Most of these materials are a result of the products we use every day to clean our homes. No current law requires cleaning product manufacturers to test their products for safety or list ingredients. Ingredients are safe guarded against public knowledge because they are classified as “trade secrets” in the industry. Many cleaning products contain warnings such as “hazardous”, “danger”, and “poison”. Yet these labels have little information identifying their chemical compounds. For products with labels, the New York poison control center found in one study that 85% of these labels are inadequate and are partly to blame for the increasing exposure to hazardous compounds (2). Take the initiative to protect your health and discover what products and cleaning agents are toxic and which are safe. Warning Labels: Avoid any product labeled as dangerous, hazardous or poisonous. These dangers are not isolated to their consumption but also pose harm if the chemicals are inhaled or come into contact with skin. Incomplete Ingredient Lists: Avoid using any cleaning agent that does not provide a list of all ingredients. Specific Toxic Components: Avoid products with petroleum-based surfactants, chlorine, formaldehyde or phosphates. Instead, do seek out properly labeled products such as those that are “non-toxic” and “biodegradable” amongst other certifications. Health food stores like Whole Foods offers a large variety of natural cleaning products readily available. Companies like Shaklee provide non-toxic cleaning supplies and are innovators of leading cleaning products. One of the best ways to improve the cleanliness of your home and optimize your health and budget is to create your own natural cleaning supplies. Homemade cleaning strategies are generally inexpensive and simple. Acidic substances are some of the best natural cleaning agents. Acid is a natural sterilizing agent that aids in the removal of dirt and bacteria. The following list contains some of the best naturally acidic cleaning substances. White Distilled Vinegar: White distilled vinegar has been used for more than 10,000 years. It is equipped for uses on floors, glass, mirrors, carpets, chrome, garbage disposals and shower heads. This amazing all-purpose cleaner is inexpensive and is a strong deodorizing tool. Us vinegar for uses ranging from the kitchen to the bathroom. Vinegar also acts as a powerful home insect repellant. Lemon Juice: Lemon juice contains a high amount of alkaline elements. Digested lemon juice is metabolized into an alkaline ash inside the body. A highly acidic substance, lemon juice has a pH of 2 when not broken down and outside the body. Its primary component, citric acid disinfects and cleans while providing a natural lemon fragrance. Combine lemon juice when using vinegar in many household cleaners for additional freshness and sterilization activity. Baking Soda: A natural alkaline substance, baking soda is a sodium bicarbonate. A natural odor eliminator, baking soda neutralizes both acids and bases. Unlike synthetically produced odor “eliminators”, baking soda actually does eliminate odors rather than adding more chemicals into the air which only cover up smelly scents. Baking soda also can be used to remove stains from surfaces as fragile as fine china. When used as an abrasive tool, baking soda can be scrubbed on sinks, countertops and other surfaces. Citrus Seed Extract: Citrus seed extract is analogous to the properties of lemon juice. Typically made from grapefruit seed, citrus seed extract functions as a natural preservative and a strong antimicrobial substance. You can get grapefruit seed extract in health food stores and online. For some of the best cleaning scents use lemon, orange, lavender, tea tree oil (melaleuca) and peppermint. Most of the materials you need to prepare your own effective cleaning products are probably already lying around your home. If cleaning natural stone such as marble or granite, be sure to read the following section on the dos and don’ts for cleaning these natural surfaces. Otherwise, use this all-purpose cleaner to disinfect bacteria and remove dirt and grime from almost any surface. Never use an acidic cleaner on a natural stone surface. The acid will actually eat away at the stone. Use your dishwasher liquid to create this cleaner. Vinegar is one of the best multi-surface cleaners. Rather than tossing your leftover citrus peels from oranges, lemons or limes save them for this all-purpose spray. Do you struggle to clean your antique brass fixtures in your home? From your lighting fixtures to your faucets and doorknobs, there is an easy and toxic free solution using these two common kitchen items. Simply take lemon juice and table salt and use them with a sponge to make natural cleaning products that will make your brass shine! Coffee Grinds: Don’t throw out your used coffee grinds after you have your morning coffee. If you enjoy the scent, allow the coffee grinds to dry completely before tucking them away into your own scented sachets. Simply find a piece of material you like and tie the sachet off with a string. Place them in a bowl or hang around your home. If you are not a coffee drinker, try first asking your local coffee shop for some of their used grinds. Otherwise, fresh grind your own beans. Dry coffee grinds are also effective at freshening the air. Stovetop Brew: Simmer a pot of spices and fruits over the stove or near a fireplace during the winter. Toss in your favorite seasonal scents throughout the year. In the fall and winter use orange peels, cinnamon sticks and cloves and simmer rosemary stems and lemons peels in the spring and summer. White Vinegar: Placing a cup of white vinegar out is also a simple and easy way to deodorize the air. If you prefer, or when company is over, simply place the cup or bowl in a confined and hidden space. You may also find that doing so will help you trap any pesky fruit flies so consider such issues when you seek a location. If you still prefer to purchase your cleaning products rather than make them yourself, here are a few products you can have shipped to your door from Amazon. Good Housekeeping combines consumer reviews with decades of experience cleaning homes and overall cost and product testing. Listed are some of their recommendations for a greener clean (3). Another great product to choose from is Dr. Bronner’s Sal Suds Liquid Cleaner. This product ranks high amongst the Environmental Working Group due to its disclosure of ingredients and limited health and environment concerns (7). The product comes in a citrus scent but this fragrance is naturally derived from its major cleaning agent, orange essential oil. Try this out instead of the toxic household cleaning products. Although Good Housekeeping lists Arm & Hammer Essentials, 2X Concentrated as one of the safest and greenest tough on stain detergents, the product has stirred up some concern with the Environmental Working Group (EWG) (3). You may also choose to consider using essential oils in your home. There are a plethora of essential oil diffusers on the market depending on your need, purpose and specific criteria. Essential oil diffusers are a great way to add burst of concentrated scents into the air to kill bacteria that may be circulation, repel pesky bugs or simply freshen your space. Here are some simple things you can do in addition to what has been discussed thus far in order to reduce toxicity in your home and clean up your indoor environment. Use Plants: One of the best air filters that you can purchase are plants. Consider adding easy to maintain household plants into your atmosphere. Some common varieties include ivy, spider plants and the Boston fern. HEPA Filters: Use a vacuum that has a HEPA filter. Replace Filters: Regularly replace furnace and A/C unit filters. Open Windows: Open windows to allow fresh airflow and promote the ventilation of toxic gases. Prevent Dust Build-Up: Use microfiber cloths or 100% cotton materials to dust and prevent the spread of additional dust. I’ve noticed that some of the ingredients in Sal Suds are sodium lauryl sulfate, coco-betaine and lauryl glucoside. Aren’t these ingredients a bit harsh on your skin should one come in contact with them and better avoid them? Both adults but especially children could easily come in contact with surfaces that have been cleaned by such a product. This was a very eye opening post. I don’t think I could ever buy another over the counter cleaning product again. I am excited to start replacing my cleaning chemicals. The citrus spray sounds wonderful!! Great post. I use the citrus spray and the essential oils have been great for my chiropractic clinic. A lot of my patients enjoy the aromatherapy. Great to hear about this Dr Holly! Great and quite useful recipes! I’m recently trying to use more natural cleaning solutions and your pieces of advice seem to be quite effective for me. Definitely trying and recommending this post to some friends. Greets!